Post once a day. Tell people about your product. Respond to comments. Done. Does this sound like the extent of your business’s social media strategy? If it does, it’s time to put on a new coat of paint. Simply having social media accounts for your business offers you neither exposure nor interest. Only when these platforms are used expertly do they yield results. Let’s talk about how Facebook, Instagram, and Twitter can be your right-hand marketers. Okay. Let’s be real with social media. It can be a serious challenge to pick up a social media platform. Ground-up progress isn’t quick, easy, or cheap. Since the purpose of a business social media page is engagement and conversation, the strategy behind the goal must be detailed and focused. However, most businesses don’t have a plan. Be different and you’ll succeed. What makes an effective strategy? An overarching plan should include a mission statement, goals and plans, and the overall objective of social media involvement. Consider these questions as you plan: Who is our target audience? How will we involve our followers? What does our social media page need to look/feel like to generate success? Why would others be interested in following us? An effective social media plan is written down, communicated throughout the business, and implemented with exactness. If you’re able to foster authentic conversation on your page, you deserve a pay raise. Now, creating a space for idea-sharing and re-posting is considerably easier with certain businesses. However, each brand can find a niche to succeed in. What works? Identify what your customers want. Discounts? Tips and tricks? Entertainment? Experiment with giveaways (make sure they’re good!) 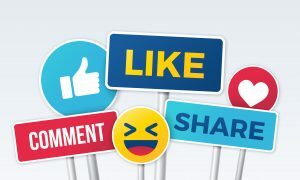 that require interaction and benefits unique to social media. Also take the time to respond to customers, talk to them, and understand them. They’ll be much more likely to stick around. There are countless ways to measure social media progress. A quick way is to look at a historical count of total page likes/followers. This is easily accessible on most platforms. To effectively use the data you receive, it’s important to categorize posts and determine what is receiving traffic and what is not. This can help you refine your plan and eliminate less popular content. Another great way to measure progress is to download an inexpensive social media tracker app. You’re able to determine when the best time for posting is, who has recently started following you (or unfollowing you), and historical growth over a specified period of time. Social media success takes time. Expecting overnight growth just isn’t going to happen. However, if you’re scratching your head in the social department, contact Perfect Point Marketing. Social media doesn’t have to be a drag. Make it fun and keep it original. Do what works for you and success will follow.